The largest banking institutions have marketing departments with more staff than most banks and credit unions have total employees. And yet institutions of all sizes tend to face the same challenges — the same tectonic forces of change in both technology and consumer behavior. Financial marketers at institutions of all sizes crave assistance in how to cope with the ever-growing set of issues, without tearing their hair out in frustration. In a webinar hosted by The Financial Brand, James Robert Lay, CEO of the Digital Growth Institute, addressed the angst banking providers wrestle with as he discussed common challenges — and solutions to them — in a rapidly changing marketplace. Here are four of the seven biggest digital marketing hurdles covered in the webinar. Two-thirds of financial marketers admit their institution lacks a clear digital marketing strategy. That’s a problem… a big one. Like “muscle memory,” many legacy institutions default to a traditional marketing tactics centered around a branch-based strategy. As a result, financial marketers spend too too little time accelerating their digital learning curve. “I hear from financial marketers all the time,” says Lay, “telling me that, ‘We’ve rebuilt our website and placed some digital ads, we’re sending out emails and posting content on social media. But we’re still not seeing the results that we hoped for’.” He labels these efforts: “dabbling in digital,” and says the results will never be satisfactory. Solution: Flip the revenue model to where digital is recognized as the primary driver for future growth and where the branch supports digital. Lay believes that the branch still plays a role — despite what some believe — but its role has vastly changed and will continue to evolve. Making this “mindset shift,” as Lay calls it, will create space and time for the marketing team to focus on digital growth. Many of the new digital-focused financial brands — the fintechs and challenger banks — are guided by a singular purpose, Lay states, whereas most traditional financial institutions are still largely focused on products and rates. “Banking and money are very stressful topics,” says Lay, “which affects people’s health and relationships.” Millennials in particular are looking for more than just a product; they’re looking for someone to guide them to a better future. 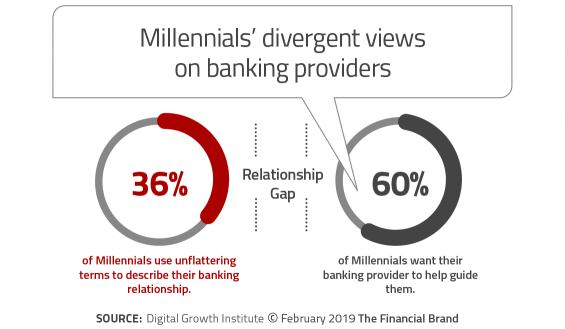 Problem is, slightly more than a third of Millennials don’t trust their primary banking provider. Lay calls that “The Relationship Gap,” and says it stems from how the C-suite continues to focus mainly on products, profits and products. This is a losing strategy now that consumers have so many more choices, he warns. Solution: To bridge this relationship gap, a bank or credit union has to first build trust. Many institutions may feel like they have that already, but among younger generations, impacted directly or indirectly by the financial crisis and Great Recession, that is no longer a given. Trust is built on a deep emotional foundation, according to Lay. Purpose is how financial institutions can establish that trust. 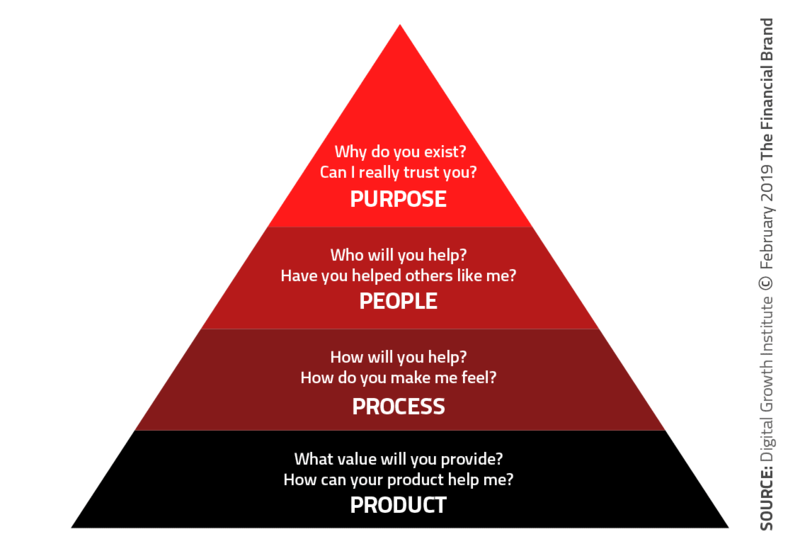 The consultant uses a pyramid concept to describe this point. A deep-rooted problem for many banks and credit unions is the legacy thinking of trying to be all things to all people. Related to that is the reliance on outdated mass-marketing approaches to reaching audiences. Lay maintains that use of personas can better match marketing efforts with the purpose-statement approach described above. “Without personas, it is impossible to empathize with the people who marketers are trying to help,” he states. Further, personas “help humanize the digital experiences that banks and credit unions are delivering.” They can also be used for training call-center or digital sales teams. Turn all of the above into a written narrative, humanizing it with visual imagery. Do any of these describe your current digital marketing? Lay says all this represents “narcissistic marketing” — all about us. He says it’s still far too common in what he sees the industry doing. Narcissistic marketing positions the financial brand, not the consumer, as the focal point in the stories the institution tells, Lay explains. Not only does that fail to differentiate one institution from another, but it isn’t believed by consumers. By following this approach, Lay maintains, banks and credit unions build trust through content. And then, using personas, they call people to action. The whole process results in increased digital traffic, leads and conversions to loans and deposits.